Conservative Leader Stephen Harper drew a standing ovation Thursday in St. John's when he committed to a loan guarantee for the massive Lower Churchill hydroelectric project in Labrador. 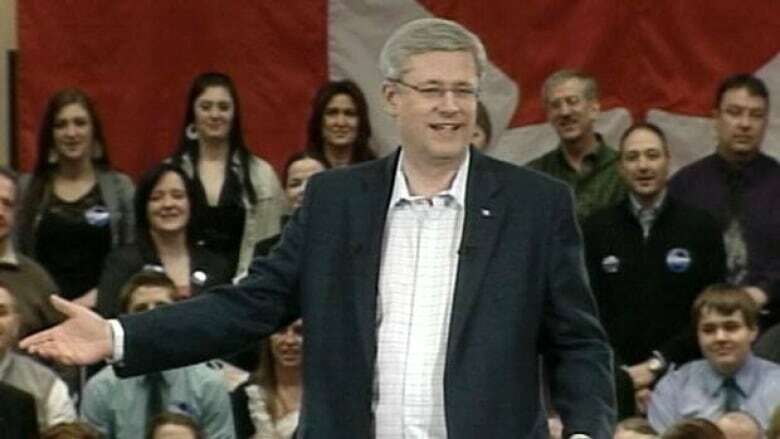 Harper told a campaign rally at a downtown St. John's hotel that a re-elected Conservative government will stand behind the plan to generate electricity at Muskrat Falls on the Churchill River, and then pipe the energy to Newfoundland and Nova Scotia, and perhaps beyond. "This is an unprecedented opportunity, a real game-changer," Harper told the crowd, while committing a re-elected Tory government to provide a loan guarantee to the $6.2-billion project. A statement issued by the Conservative Party of Canada said that the government might also provide "equivalent financial support," although it did not elaborate. Harper said the support is contingent on the Lower Churchill project meeting three criteria for energy projects that will receive federal funding through the Tories: that they make economic sense, that they provide national or regional benefits, and that they substantially cut greenhouse gas emissions. "We need you. We need your support," Harper told the audience, noting that Thursday marked the 62nd anniversary of Newfoundland joining Confederation. 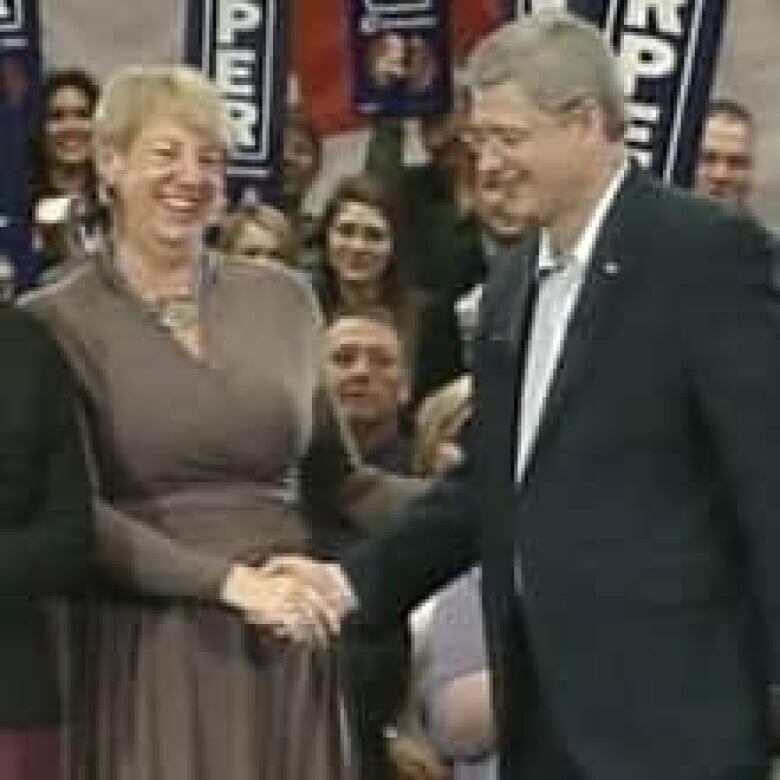 Harper was welcomed warmly by members of the governing provincial Progressive Conservative party, a stark contrast to the hostile reception he received in 2008 when then premier Danny Williams waged an "anything but Conservative" campaign that shut out the federal Tories from the province's seven seats. In contrast, Harper stood smiling on a stage next to Newfoundland and Labrador Premier Kathy Dunderdale, who has been keen to obtain two types of federal support for the Lower Churchill development. In addition to a loan guarantee, Newfoundland and Labrador and the Nova Scotia government are seeking funding through an infrastructure program for subsea cables linking the two provinces. Harper's message in St. John's was markedly different in tone from remarks he made earlier in Halifax, when he said he liked the Lower Churchill plan, but said that much needed to be to done before a deal could be struck. "There is a lot of discussion still to come, but it is obviously an important project," Harper told reporters in Halifax. "He's treating us like dimwits," said Liberal MP Gerry Byrne, who represents the western Newfoundland riding of Humber-St. Barbe-Baie Verte. Byrne said Harper's Halifax comments probably better reflect the project's status, and that voters in Newfoundland and Labrador will not easily forget the ABC campaign of less than three years ago. "That breach of trust was deepened today," Byrne told CBC News. "The gap was not narrowed today, it was widened." But Dunderdale, speaking to reporters after Harper's rally, said she is willing to trust Harper's commitment to the project. She said she is also prepared to side with Harper because she believes the Conservatives will form the government in the May 2 election. Harper did not take questions from reporters about the Lower Churchill project. Newfoundland and Labrador, its Crown-owned energy corporation Nalcor and Halifax-based Emera Inc. announced a deal in November to proceed with the Lower Churchill, although the larger component of a long-envisioned project — a generating station at Gull Island — will not be developed under the current plan.